Scene from Locke and Key TV pilot. If you’re channel-surfing through a sea of mediocrity this fall, blame Fox for not green-lighting a show that could have easily been your new weekly obsession. The failed pilot for Locke & Key premiered at the 2011 San Diego Comic-Con a few weeks back, and it’s pretty clear why Fox refused to give the show the green light. It’s a beautifully-shot, haunting hour of potential-television. It’s also filled with great performances, and made with equal parts terror, comedy, and tragedy. In other words, the Locke and Key pilot failed by being too damn good – and also a little too dark – for network television. Based on the comic of the same name (written by Joe Hill, son of Tabitha King and the guy that wrote Tommyknockers), the Locke & Key adaptation is less David E. Kelly’s leather-clad Wonder Woman, and a whole lot more Walking Dead or Game of Thrones. It’s a haunted house story of sorts, one that follows the grief-stricken Locke family who are trying to rebuild their lives in a mysterious manor. It’s kind of like if Little House on The Prairie started with Michael Landon being shot in the face in the first episode, followed by the family moving into a house designed by H.P. Lovecraft. Or if Our House took place in the House of Leaves. The “haunted house” in Locke & Key is filled with a dozen supernatural keys that open doors with weird and unexpected results. In the pilot episode, the youngest Locke sibling, Bode, discovers the powers of the Ghost Key. It’s a game-changer in the comic, when Bode finds the right door to open with key. When he tries to walk through the frame of the Ghost Door, his body drops seemingly dead to the ground, while his ghost-like form rises from his body. In the pilot it’s an equally pivotal scene. It’s exact the moment where you can tell Locke & Key could have been something special, balancing fantasy elements (and CGI) with pained characters fighting through very real grief. Mark Romanek, who also directed the criminally underrated 2010 movie Never Let Me Go, fills the frame wonderfully with haunting images from the comic, while still making it feel like its own thing. The pilot strikes the perfect grounded tone for a premise featuring a ton of craziness, including a heartbreaking murder, a mysterious woman trapped in a well, and the aforementioned Ghost Key special effects. 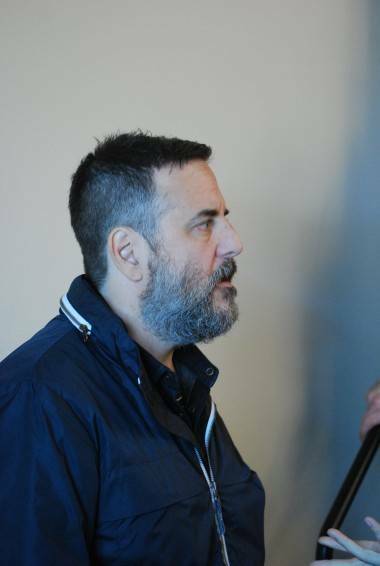 Mark Romanek at the Locke & Key panel at the 2011 San Diego Comic-Con. While most pilots show glimpses of potential greatness, Locke & Key found its footing early on, as the members of the Locke family gel together more convincingly than my own family reunions. There isn’t a weak link in the cast, but there were two huge casting surprises. First, they managed to find a child actor (Skylar Gaertner) that would have fit in just fine on the big screen alongside the kid actors from this summer’s Super 8. 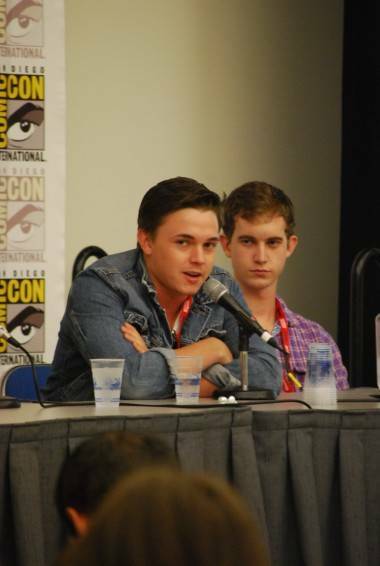 And the second surprise was that the comic’s brooding-jock-older-brother was played completely convincingly by ex-pop star Jesse McCartney, who looks nothing like his comic book counterpart – a comment echoed by more than a few people after the screening. 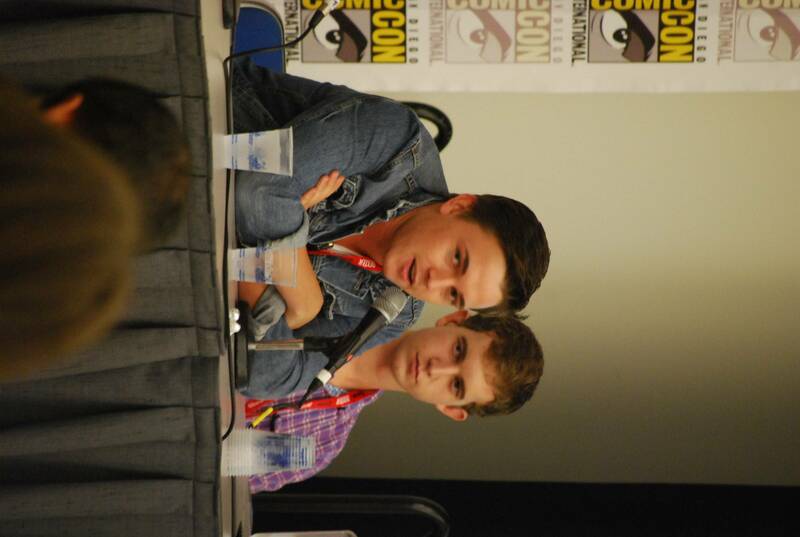 Jesse McCartney and Harrison Thomas, who play Tyler Locke and Sam Lesser in the Locke & Key pilot. After the screening, executive producer/writer Josh Friedman offered a jokingly humble explanation for why FOX passed on the series. “We were victims of our own high standards,” said Friedman, who wasn’t that far off. Although the pilot may have been too dark for the Glee crowd, a legitimate concern from those who read the comics is how true to the series would have stayed to the source material, since the pilot encapsulates almost the first collected story, “Welcome To Lovecraft”. The fourth collected volume of the comic just recently came out, a scarcity of source material which seems problematic if the producers wanted to make it past five episodes, let alone get another season. 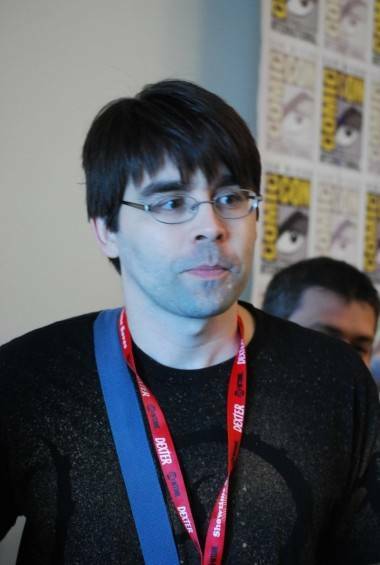 But in the panel afterwards, the L&K crew explained the series would have followed “a key-of-the-week” format – similar to the X-Files monster-of-the-week – with the gang discovering a new key each week. Every third or fourth episode would have had more of the core plot and mythology from the comic. The pilot also ends with a Pan’s Labrynth-inspired cliffhanger that’s an intriguing curveball, even to the comic series’ faithful. 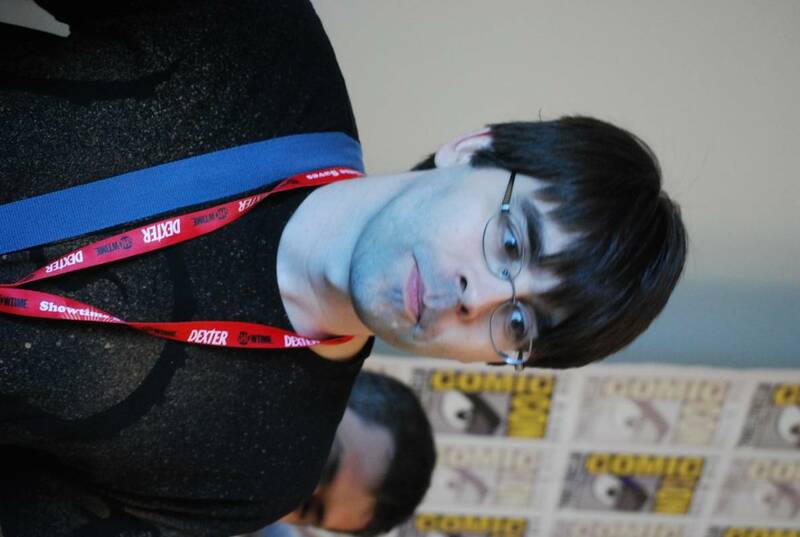 While everyone on the panel said the chances of the show being picked up are dead, Joe Hill recently wrote on his blog that “a few doors remain open” and offered this photo clue, which Hill said he knew nothing about. It’s easy to blame Fox for denying us an ongoing Locke & Key show, but it’s still sort of a weird situation when they’re proud enough to show it off, almost like they’re taunting us with the scalped remains of another show that could have been awesome, or, at least, could have been a huge cult hit. But even though it’s been killed, the Locke & Key pilot can take a little solace in joining some pretty great company in Rupert Murdoch’s trophy room of murdered television programs, probably hanging up on a wall, somewhere in between the pilot for the infamous Heat Vision and Jack and cancelled series like Dollhouse, Firefly, and Futurama. 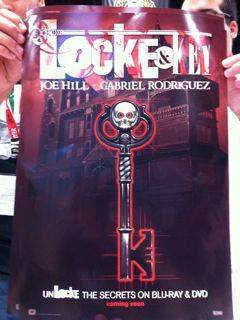 This entry was posted in Features, news, the latest and tagged Joe Hill, Locke & Key, news, San Diego Comic-Con, TV. Bookmark the permalink.